This well carried out 'Le Voyageur' A Class conversion was spotted in September 2001 on the sea front car park at L'Estartit on the Costa Brava, I would have loved to have been able to have a closer look but the occupiers, a disabled Frenchman and his partner, spoke no English and my French is very poor. They were in a hurry and although we waited two hours for them to return, I had to be content with a peek through the windows. 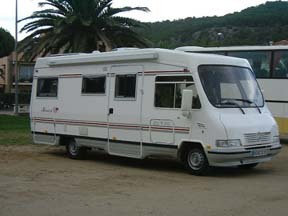 Build on a Mercedes 316 CDI Sprinter chassis, it had a fixed double bed at the rear, infront of which was a side toilet with double opening doors. Opposite this was the kitchen area with a wheelchair accessible sink. Directly behind the swivelling drivers seat was a dinette of which the drivers seat formed a part. Hand controls were fitted, so I assumed it was fitted with a Sprintshift automatic gearbox. It also had a very neat lift which I think may have been an electrically operated Ricon KlearVue.